Coral Cash Slots is a 5 reel 9 payline Cryptologic progressive video game released in September 2004. Hit RAPID FIRE Progressive Jackpot, dive deep to collect treasures with 15 Free Spins and 3x Multipliers, get the gems out of the sea bottom with SUNNING wild mermaid, and exchange scattered corals for tones of cash. Hit the $40,000 Top Jackpot and enjoy your imaginary diving with Coral Cash. The slots features a sea theme. Check the symbols on the reels and find out what to expect from the game. Spinning the reels you will find Corals, Mermaid, Green Fish, Dolphin, Flippers, Rock Fish, Snorkel and Mask, Sea Horse, Conch Shell, Clam Shell, Fan Shell and a lucky Starfish. The symbols constitute 41 winning combos. 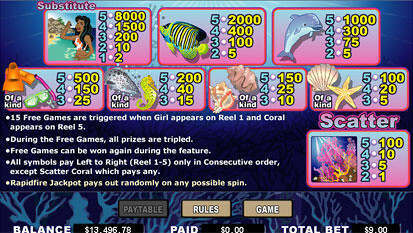 The highest Coral Cash jackpot is 8,000 coins or $40,000 for 5 Mermaid symbols. The second Coral Cash jackpot is 2,000 coins or $7,500 for 5 Green Fish symbols. 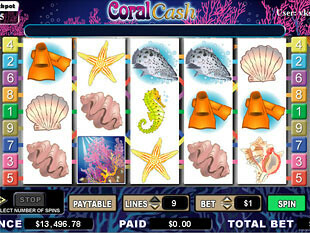 The third Coral Cash jackpot is 1,500 coins or $2,500 for 4 Mermaid symbols. HOT WILD Mermaid is swimming in the waters of Coral Cash ocean. As you already guessed brunette Mermaid is a wild symbol which promises you the ROCKIN’ TOP JACKPOT. Foxy wild Mermaid is a SYMBOL OF WEALTH. Every time she appears on the reels, she substitutes for all symbols except scattered Corals to create much more winning combos, to award you much more prizes! During the free games feature, the generous Mermaid will triple your wins. Corals is a scatter symbol. Scatter Corals and earn prizes. This symbol promises you large Multipliers and scatter wins. 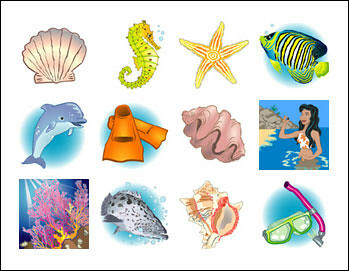 Collect 5 Corals symbols and exchange them for 100x total bet Multiplier! Play with the maximum total bet and get the max scatter payout worth of $500. However, 4 scatters will award you 10x Multiplier or $50. 3 or 2 scatters award 5x or 1x total bet Multiplier. Free Spins Feature. Win 15 Free Spins with 3x Multiplier by triggering wild Mermaid on the 1st reel and scatter Corals on the 5th reel simultaneously. Free Spins feature can be retriggered anytime. Free Spins feature is your FABULOUS chance to accumulate tones of prizes. Check out the ticket on the left of the reels. Can you see the digits increasing? RAPID FIRE Progressive Jackpot is growing right on your eyes! The jackpot can fall on you like an unexpected MONEY RAIN. Relax, don’t hope to catch any special symbols to hit it. The Progressive will award randomly, any moment after any spin. The best thing about the progressive is that it absolutely does not depend on your coin value or total bet. The impressive sum will be all yours even if you are playing with 5 cent. Coral Cash slot machine is a generous Cryptologic game with truly large payouts and jackpots. If you feel fortunate today, this slots is definitely worth playing. With its soothing sea theme and cute reel icons, the game will grant you the PLEASURE of relaxation and of course, great payouts! Play 15 Free Spins and win large, hit the progressive and afford your own sea voyage!